Vienna Symphony Orchestra*, Vienna Philharmonic Orchestra/Karl Böhm. Perhaps this DVD will act as a reminder of the power of the medium. These are two fine performances by two great artists - and here we have the opportunity to study their most intimate movements in performance. 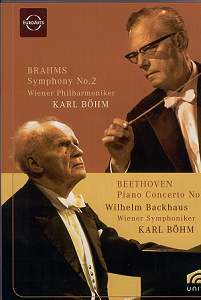 Piano students will surely glean volumes from Backhaus's sovereign technique; conducting students may find less to admire in Böhm's rather staid manner and gestures, but nevertheless can observe a major podium figure of the past at close quarters. The set-up in the studio is typical for the period, with the conductor rather isolated from his fellows. In these rather sterile conditions, Backhaus and his accompanists create a sense of wonder. There is a true inevitability about the first movement; on a straight play-through, though, the second movement begins far too abruptly. Instructive to compare this with Backhaus's much earlier performance of 1929/30 with the LSO under Sir Landon Ronald. I used the Andante transfer for this purpose. There the first movement takes 17:06 against the later performance's 17:52, and the orchestra is significantly recessed. There is more delectable impetuosity earlier on, it is true. Backhaus sits very low, his contact with the piano seemingly enhanced by this. Most importantly, there is a tremendous weight of experience that shines through in 1967. Camera work is acceptable, although the shot of the piano's insides at the first movememt's cadenza is rather fanciful. Backhaus's contributions to the famous slow movements are miracles of concentration. The piano sounds absolutely lovely although I remain aware some might find it very slightly muffled. The pianist's gentle approach bleeds into the finale. It is here the camera-work can be rather distracting, as it pans around. But most interesting of all is Backhaus's use of his own huge cadenza in this last movement. Böhm's Brahms Second has a distinctly open-air feel about it. There is some glorious horn playing … and not only at the opening, either. What really marks out this Brahms is the fact that despite its intensity, one can still hear all the lines with an almost analytical clarity. This feeling of analysis in sound carries over very noticeably to the second movement, where the conductor seems intent on showing us Brahms' motivic workings. He also injects a substantial amount of drama into this Adagio non troppo before letting his Vienna soloists loose to reveal their delicacy in the Allegretto grazioso. Finest of all, perhaps, is the finale, fast but blessed with wonderful string definition and with real drive and excitement before the end. These were originally Unitel films - directed by Herbert Seggelke and Arne Arnbom. They provide a TV screen-sized window onto another world, and we should be grateful to have the opportunity to relish these warm performances.